To seal joints, such as those between a tub and wall, caulk is applied to create an airtight and watertight junction. In the past tar or pitch were often applied for nautical or plumbing purposes, but today, caulk is made of materials such as silicone, latex or acrylic. Since caulk is often employed in areas that are wet or damp, it may become moldy or begin to decay over time. When caulk fails, walls or other surfaces may experience water damage. That is why periodically old caulk may need to be removed and new caulk applied. To make easier work of caulk removal, applying a gel to the caulk and letting it work overnight can make the stripping easier. Once it has softened, a caulk removal tool (scraper) can be used to remove it. Some people prefer a utility knife or blade, but an inadvertent poke or jab can lead to wall damage. Loose pieces of caulk can be pulled off by hand and any residue removed by scrubbing with an old toothbrush. Once the area is clean, a very mild concentration of bleach and water should be carefully applied to remove any mold spores. The surrounding tile should also be cleaned, to make sure the new caulk will adhere properly. Once the joints are completely dry, new caulk can be piped in. Another joint sealant that may need attention from time to time is grout placed between floor or wall tiles to hold tiles in place. Sometimes a structural failure may cause a floor to shift and grout will then dissolve or crumble over time. Alternatively, grout may have been mixed with too much water, causing it to break down. Whatever the reason, the floor or wall needs to be re-grouted before the problem expands to other areas. Damaged grout can be removed most easily by inserting the blade of a grout saw into the joint with the damaged grout and moving it back and forth. More force can be applied if necessary, but it is important to keep surrounding tiles intact. After cleaning the grout line with a vacuum, new grout can be added. Pre-mixed grout has the proper proportions of sand and cement, and needs the addition of water to make the grout pliable. It can then be pushed into the joint with a grout float and smoothed with the rounded end of a craft (Popsicle) stick. 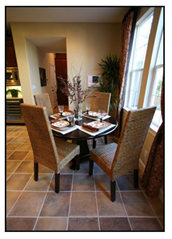 Once the grout is in place, it is necessary to clean the surrounding tiles of excess grout. Using a clean sponge and rinsing often will prevent smearing. A mixture of equal parts of water and white vinegar can also serve as an effective rinse. Temperatures and humidity will affect drying times but contact with the floor should be avoided until the grout has totally set. The final step is the application of a grout sealer with a small brush. The sealer also needs adequate time to dry. In a pinch, most tile shops offer sanded caulk in colors that will match most existing grout colors. This caulk should only be used for very minor tile gaps of one-quarter inch or less.